Flat screen TV’s are great, except for one thing, as they’ve got thinner over the years they’ve also started to sound worse and worse. Case in point in our bedroom Samsung LED Smart TV. It’s great, it even runs Plex natively, but it sounds so frustratingly bad. At a point about half way up the volume scale it doesn’t actually get any louder, the numbers rise but the sound doesn’t. So we were especially excited when the KitSound box turned up at the Automated Home a few weeks ago. The Unity is the first soundbase from KitSound. A rectangle about 4 inches hight that sits beneath your TV. Unlike some soundbars it’s not in front of the TV (possibly blocking IR) or doesn’t require a mounting bracket either. Its a sturdy unit and we think it looks great with its brushed metal sides and meshed front. That strength allows it to support tellys of up to 50kgs on its tempered glass top. Round the back there’s an optical input (helpfully an optical lead is included), along with 3.5 mm aux-in, meaning that there is almost nothing that you cannot connect to your Unity. There’s Bluetooth connectivity too so you can play music from your smartphone or tablet from up to 10m away. There are four front firing drivers which combine with a built-in bottom firing subwoofer. Although not as bassy as other systems we’ve heard with a separate sub-woofer, the 100 Watt output is plenty loud especially on the AUX input which has the advantage of turning up and down with the TV remote rather than the Unity’s . The selected input shows on a display neatly mounted behind the speaker grill making it easy to identify at a glance. It also thoughtfully disappears after a few seconds so as not to spoilt movie night with a bright blue LED in your face. Selecting the required input is a breeze with the little IR remote too as well as adjusting the treble and bass. There are touch buttons on the top of the unit to give you local control when the remote down the back of the sofa. The Unity automatically turns itself to standby mode after a period with no input detected. Bottom line the Kitsound Unity Soundbar has made our TV as good to listen to as it is to look at. It’s loud enough for anyone whilst bringing some much needed bass too the experience too. Available now for around £150. 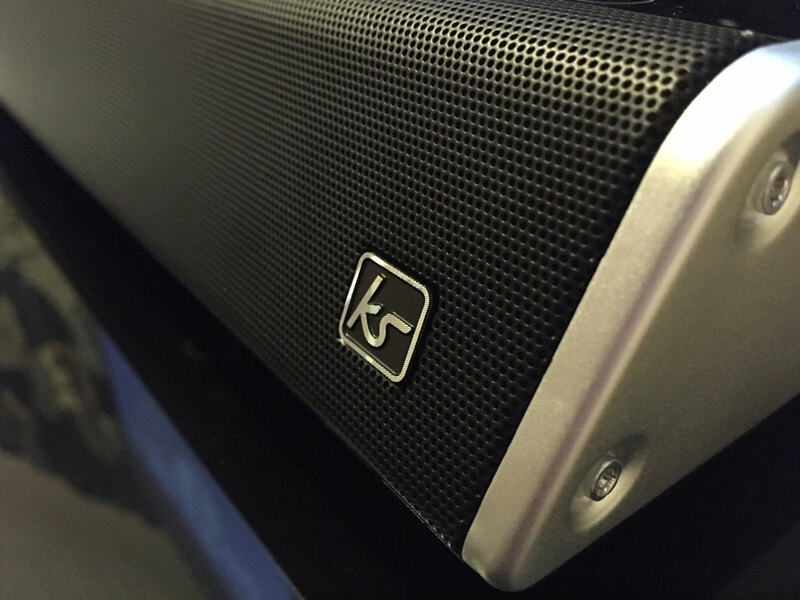 Be the first to comment on "Review: Kitsound Unity Soundbar TV Base"